Analogue or digital interface, a wide range of temperatures, as well as an integrated humidity measurement – these are some of the advantages provided by modules offered by DFROBOT. 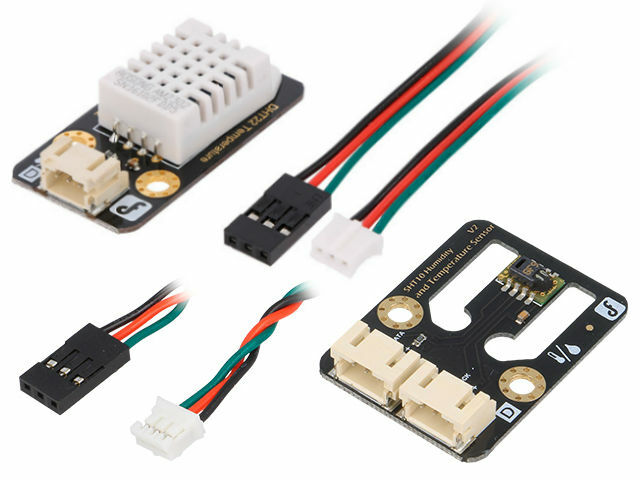 Their products feature universal connectors and a diversity of ICs used. What is more, thanks to the connection wires included with each module, connecting a thermometer or a hygrometer to an Arduino board or another microprocessor circuit takes only a moment. The DF-SEN0206 digital module deserves to be distinguished here. It is based on the MLX90614 thermometer from a Belgian company Melexis. In contrast to other popular solutions, this sensor detects infrared radiation. Contactless, super-fast measurement unaffected by thermal inertia is conducted within a broad range of temperatures: from -70°C to over 300°C. It can be used in industrial conditions, yet the manufacturer recommends it for hobbyist projects, e.g. for building an unprofessional pyrometer. Another feature worth mentioning is the analogue interface of the DF-DFR0023 module. It will be appreciated by developers who wish to save memory by eliminating “heavy” communication libraries from the code. Check out the full offer of temperature sensors from DFROBOT at TME.